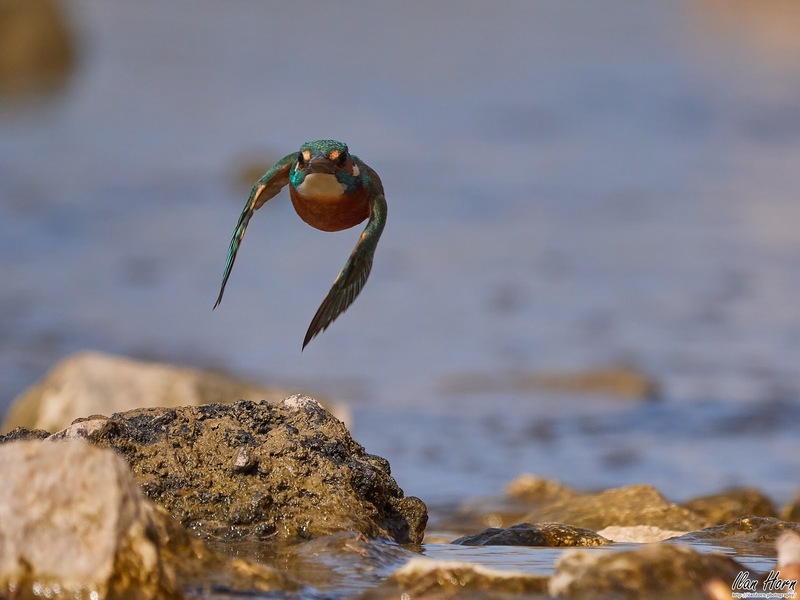 This is a Common Kingfisher, in flight, coming right at us! This photo took some preparation to get, and did not come out perfectly (the Kingfisher is not totally sharp, I believe), but I'm happy to have been able to capture it at all! I was sitting near the water observing the Kingfishers catching fish, and noticed how they flew close to the water in a repeating pattern. So I set my camera up to focus on a location that they frequented, with a fast shutter speed (1/2500 of a second, to freeze the action), and the fastest burst speed my camera supports (20 frames per second) to get just the right moment. I waited patiently and pressed the shutter button just as they flew through that spot again. Here's the result! What do I like about this photo? The pose is awesome, showing the Kingfisher in a way that we can almost never observe. The Kingfisher is in focus, while the background is not, thanks to an open aperture (f/6.3 - the most open my lens supports at the focal length of 400mm). The action is frozen, thanks to the fast shutter speed. What would I want to improve? As stated above, the focus is not perfect - the wing on the left is in good focus (and the rock below), but the head less so. Perhaps I should have set the focus on the rock and used the 60 frames per second burst speed and selected just the right moment that way.